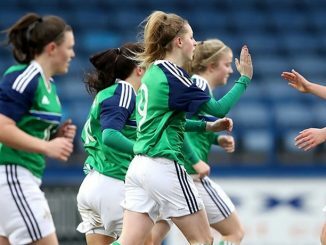 Northern Ireland still have a slim chance of reaching the last four of the UEFA Women’s U-19 Championship Finals, thanks to a battling 1-1 draw against Scotland. Megan Bell shot wide of the target for the hosts from an early free-kick and Scotland’s first clear-cut chance saw Kirsty Hanson play a neat one-two with Samantha Kerr before firing narrowly over the bar. Scotland upped the tempo at the start of the second half, taking the lead in the 46th minute when Hanson got in behind the defence and slotted the ball past Perry into the net. Rebecca Bassett was just wide of the post and Leyla McFarland shot straight at the Scottish keeper when well placed, before Perry was in action again pushing Adams’ effort round the post and then palming away a long range belter from Courtney Whyte. From the resulting corner, Donna Paterson headed the ball inches over the bar. But there was joy for much of the 1,771 crowd in the 86th minute, as Megan Reilly’s corner was headed home by Louise McDaniel and it was nearly a dream finish for the hosts as Bassett weaved her way into the box but the Scotland keeper saved – and the game ended all square. 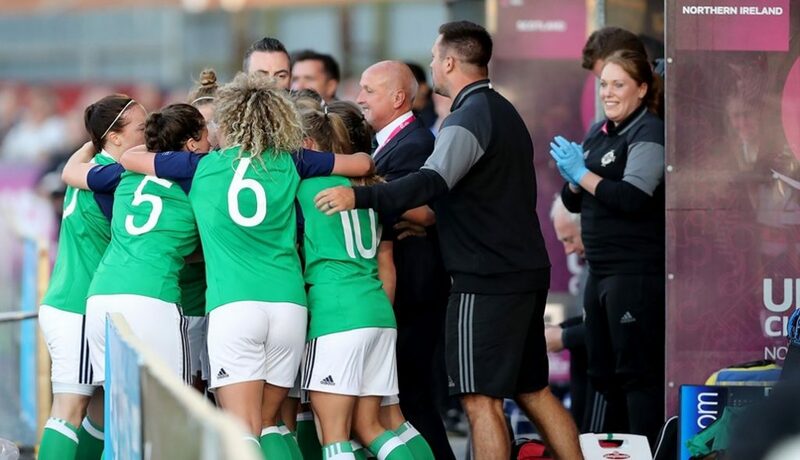 Germany made it two wins from two with a 2-0 victory over Spain in Portadown, as they secured progress from Group A into the semi-finals. Luca Maria Graf fired Maren Meinert’s side ahead from outside the penalty area in the 25th minute. Dina Orschmann doubles the lead direct from a free-kick midway through the second half. Spain had substitute Natalia Ramos sent off late on in the game. 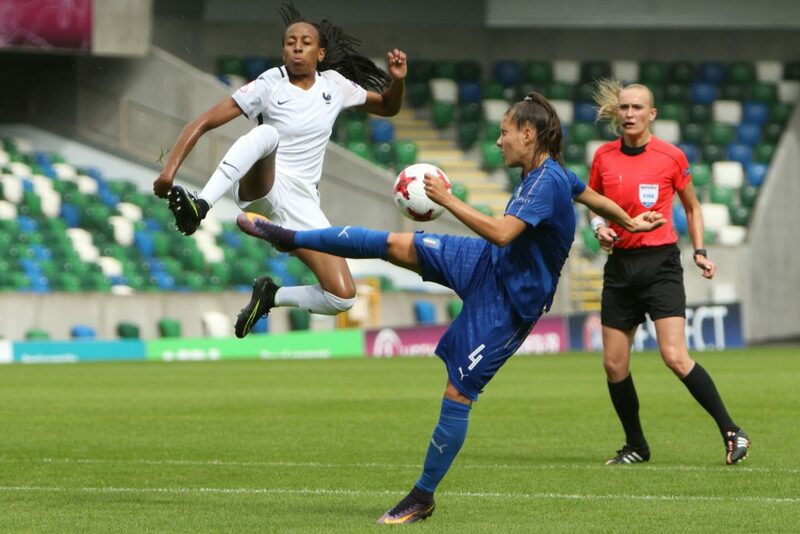 Group B’s double-header at Windsor Park began with France bouncing back from an opening day defeat to thrash Italy 6-1. Annamaria Serturini struck first for the Italians but Mathilde Bourdieu turned the game round with a brace in the space of 3 minutes. 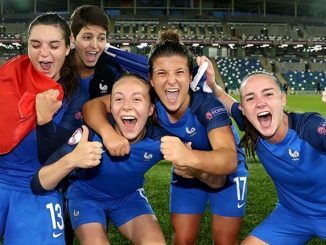 Bourdieu then completed her hat-trick on 58 minutes before Agathe Ollivier, Emelyne Laurent and Christy Gavory all came off the bench to score for the French. 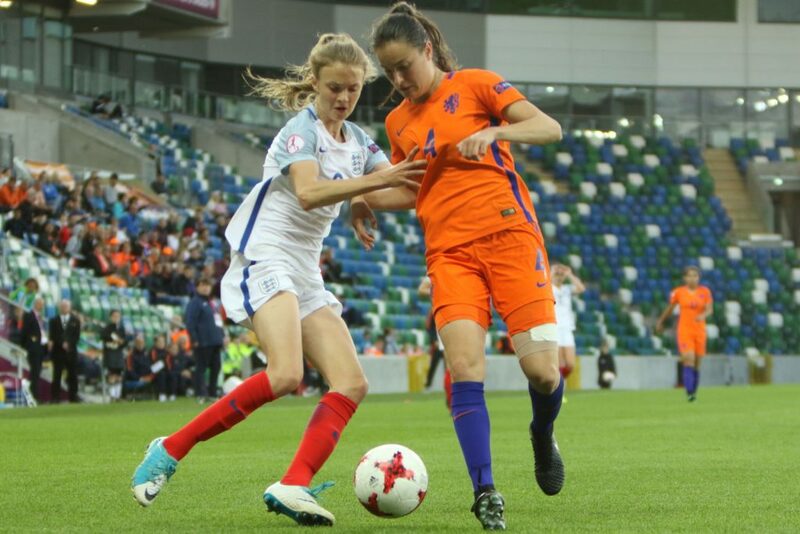 England suffered their first defeat of their Euro Finals campaign against a strong Netherlands side at Windsor Park, as the Dutch secured their place in the last four. The Oranje started strongly and skipper Grace Fisk demonstrated perfect positional awareness to clear a dangerous cross but Jessica Torney’s outfit took the lead soon after, with Aniek Nouwen heading home a corner. And it could have been two moments later, as patient Dutch build-up fed winger Ashleigh Weerden, who steered an effort over Sandy MacIver’s crossbar. Georgia Allen came close to netting her third goal of the tournament with her side’s first of the evening, fashioned by Chloe Kelly’s high pressing, but just lacked the necessary power to trouble Lize Kop between the sticks. At the other end, Nurija van Schoonhoven was picked out following a strong run but failed to hit the target and isk made a crucial block to deny Joëlle Smits but the same player did double the lead with a calm finish on the stroke of half time. Mo Marley’s outfit enjoyed some strong spells of possession in the early stages of the second period and Rinsola Babajide was unfortunate to see her dangerous cross just evade the recently-introduced Niamh Charles at the far post. Charles played a one-two with Ellie Brazil before striking inches wide and Allen’s crisp shot was well held after being played through by Babajide. The result means the Young Lionesses sit third in Group B, three points behind leaders Netherlands and level on points with France, albeit with an inferior goal difference.